A painting depicting cops as pigs amid the violence and frustration of the 2014 Ferguson protests and riots no longer hangs in the halls of the US Capitol. A congressman took it down after several police departments called for the art piece to be removed. California Congressman Duncan Hunter (R) took it upon himself to remove the painting on Friday. “Untitled #1” is the creation of David Pulphus, a former student at Cardinal Ritter Prep in North St. Louis, Missouri, and current art student in college. It is an interpretation of the unrest that took place in response to the fatal shooting of Michael Brown, an unarmed 18-year-old black man, by police in Ferguson, Missouri in 2014. In the foreground of the painting, two police officers are depicted as horned pig-like animals. One is pointing a gun at a protester. The painting includes signs, with one reading “History,” held by the leader of a large protest. Another reads “Racism Kills.” On the right side of the painting, a crucified man in a graduation cap holds the scales of justice in his hands. “The painting portrays a colorful landscape of symbolic characters representing social injustice, the tragic events in Ferguson and the lingering elements of inequality in modern American society,” Rep. Lacy Clay (D-Missouri) said in a news release. 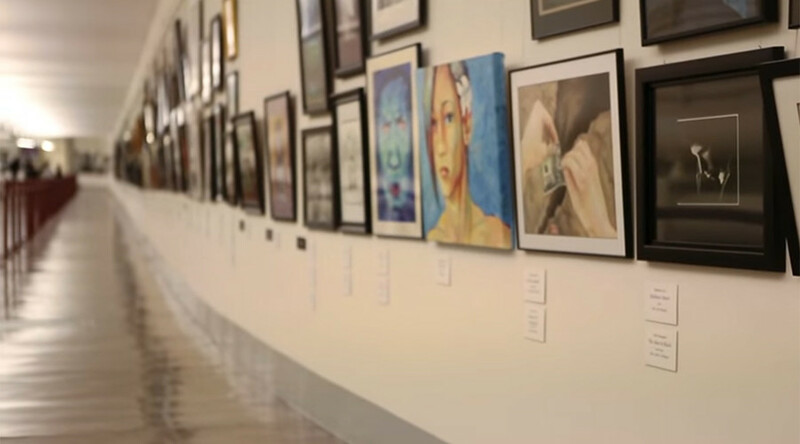 As a winner of the annual Congressional Art Competition, Pulphus’ painting was chosen to hang with hundreds of other student paintings at the US Capitol building. “It is hard to imagine that as a young African-American man from North St. Louis, I could receive such a prestigious award by the U.S. Congress,” Pulphus told the St. Louis American. The U.S. Capitol is a symbol of freedom, not censorship. The young artist chose his own subject and the painting will not be removed. According to the Washington Post, Congressman Hunter removed the painting without consulting Speaker Ryan or any authorities who ran the competition, and took it to Clay’s office.